The complex part—of the latest and greatest lightweight, super-strong well-oiled material, formed in multiple stations, punched and bent under the watchful eye of myriad sensors—exits the press in pristine condition within exacting tolerances. The technology that makes it all possible is dizzying, but such an ideal part cannot be produced without the efforts of the first link in the production chain. It all starts with the press feed. No one knows that better than Chris Crider. Chief engineer at P/A Industries, Inc., Bloomfield, CT, Crider has three decades under his belt designing and improving press-feed systems. He’s witnessed the evolution of servo motors and controls that have enabled new levels of feeder precision and performance, and has offered MetalForming his insight into what today’s press feeds can do. Then again, back then servo motors were no bargains themselves. The newer generations of servo motors also are much heartier. The increased use of gag tooling in presses, where material must be indexed in multiple, not just single, fixed lengths, owes to improved servo-motor performance and the advances in the resolution of encoders within those motors. “By alternating the indexing lengths, unique actions can be performed in the tooling, allowing additional processes to occur in the press,” Crider says. “That indexing is controlled by the feeder, allowing punching to occur in sequence with the indexing. “Feeders now can talk to the press control and share information, and incorporate job and tool storage,” notes Crider. “From the press control, feeders can be programmed for index length, when to index and a host of other parameters, all set and available for recall. This ability makes newer press feeds ideal components in press lines tasked with shorter runs with a variety of jobs using a variety of material types and thicknesses. In short, feed systems will not compromise setup time in any way. With such simple operation, an operator is not required to be a feed-system expert, and the feeder does not have to rely on constant user input to achieve and maintain accuracy and performance. For fit to a press line, a feed system only requires a power source and an interface with the press control, be it serial communication or an Ethernet connection. 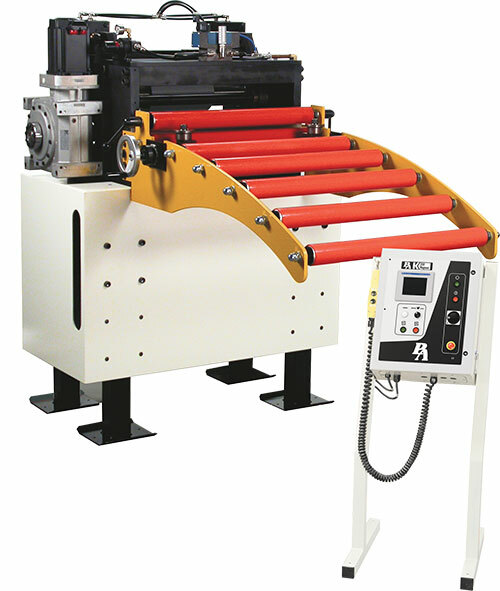 As material is threaded, strip can be jogged by hand or through the feed rolls, powered courtesy of a jog button on the control that allows precise setting of indexing. This eases setup for the first time a job is run, and, again, those parameters are saved for future recall. In addition, during operation, special features in newer-generation servo-driven feeds enable acceleration/deceleration ramping and feed-angle adjustment to minimize strip jerking or slippage, which also improves accuracy. Should positioning of the strip somehow become compromised, instead of producing bad parts the feed system can stop the line and issue a fault message. Of course, it will stop automatically should any sensors in the press or die note a discrepancy and communicate a stop order. Lastly, Crider addresses the increased use of stronger materials and how that use has affected feed-system design and operation. And, to grip without slip, surface treatments may be applied to the rolls to increase the coefficient of friction. Roll finishes or textures may be prescribed to match unique applications. For example, material may be lubricated prior to stamping, so perhaps rolls with a knurled texture are used to provide better grip. Also, devices such as measuring wheels can correct positioning should roll slip occur. I'm no longer positive the place you're getting your information, but great topic. I needs to slend some time finding out more or figuring out more. Thank you for wonderful informwtion I was in search of this info for my mission.